Each time I touch the issue of health care in America I get all sorts of responses from otherwise passive readers. It has been gratifying to see that this blog attracts a diverse bunch of visitors, with all sorts of opinions and positions. I must also say that some of the comments have been as educative as anything I've read in mainstream publications or ueber-blogs. My lesson, however, has been to stop using the issue as a foil for other topics, since it's too radioactive. Foils need themselves to be mildly interesting or easily recognizable, but shouldn't be major bones of contention - because if they are, they overpower the attempt to wield them. The folks having the discussion are free to continue at it, of course. If I don't censor our in-house agitator Fake Ibrahim, I certainly won't bother them. Just for the record, here's my basic position on health care, unencumbered by rhetoric tricks for other purposes. Any reasonably wealthy country ought to have a system that ensures that all citizens have access to reasonable health care. Everyone having access means the illnesses we accumulate as we age need to be covered, otherwise the system is meaningless. And, yes, the electorate needs to define how they're going to pay for the system. Beyond that - if it's national, or private, or hodgepodge; who decides, who adapts, who tweaks; what is the level of "reasonable" and what needs to be paid for separately; and all the other fiendishly complex questions - these need to be hammered out by the particular electorate, according to their particular conditions, mores, traditions, and abilities. Nor are the decisions of the past eternally correct: what worked well before may no longer work so well after; the compromises made by a previous generation may not seem such a good idea to a latter one - unless they actually do. Sometimes there are issues where one side is right and the other is wrong. Eastern Europe's communist regimes foiling the aspirations of their nations, for example; the present Iranian regime suppressing freedom. Rarely, you'll even find crass moral imbalance within a democratic discussion. The Civil Rights Movement of the 1960s is a fine example. Most of the time, however, discussions in democracies tend to be more about interpretations or differing legitimate values, rather than clashes between good and evil. Hard as it may be for the Americans among you to see, this one seems to be of the former type. Earlier today the next-door neighbor was kvetching. A few months ago her driver's license was revoked, and now she has to use cabs all the time. Worse, this was done to her on her birthday. Her 95th, she added, and grinned. The only way I read this article is that Franco Frattini, Italy's Foreign Minister, essentially agrees with the Israelis on the issue of the scandalous article in Aftonbladet. He seems to be saying that while governments can't stop newspapers from saying things, they certainly can condemn the worst things that get said. The Aftonbladet blood libel needs to be condemned. Moreover, he may even be saying the Swedish government agrees, and is seeking a general EU condemnation that will give them a face-saving opportunity to condemn the libel without being specific. Looks like a reasonable vindication of the official Israeli response to me. I had an interesting conversation the other day with some friends. None of us had voted for Netanyahu, and all of us felt he's doing a reasonable job. This is very unusual for us, as our natural condition is to revile our government, no matter who they are. Since it looks like he's going to be in office for a while yet, here's hoping he keeps on doing a reasonable job. Yes, there are things that scare Hamas. The mere rumour, most likely quite unfounded, that the UN may try to teach the children of Gaza that there once was a Holocaust. I don't see why anyone would take such a rumour seriously; it's quite unlike anythng UNRWA might think up; still, the Jew-hating thugs of Hamas were swift to condemn the mere thought. My friend Yehushua Bichler died earlier this month, age 80. His friends from his own generation called him Robino, from Robert, but I felt that would be disrespectful of me so I called him by his Israeli name, Yehoshua. I first met him in a graduate seminar about the SS, in the winter of 1982 I think. He was not a particularly good speaker, and he had trouble focusing what he wished to say into concise paragraphs, so when Prof. Yehuda Bauer anounced one week that the following week Yehoshua would take over for as long as he needed, we were puzzled. We remained puzzled for the first 20 minutes of the next class, too, until it dawned on us that Yehoshua was telling a story none of us had ever seen in the history books. In a nutshell, we all knew that the Nazi murder policy began with the invasion of the Soviet Union in summer 1941, and it was carried out by the infamous Einsatzgruppen, in which there must have been a few thousand men at most. Bichler, however, had uncovered documents that told of SS Brigades no-one had ever noticed, numbering in the tens of thousands, who had also been part of the operation. They were subordinate to a different part of the SS, their logistics were supported by different units, and their existance changed the picture of general complicity in the murder program. I recognize this isn't that important to most people, but in all the years since I've never again run into a historian who was able single handedly to rework the outlines of the accepted story in such a clear way. Yehoshua was aware of the stir he was creating, but it didn't go to his head. Perhaps the fact that he himself had been at Auschwitz, had watched the death of his father, and had lost 57 (fifty seven) members of his family, tempered his perspective on things. A few years later I became the head of archives at Yad Vashem; Yehoshua ran the archives at Givat Haviva, a small research center dedicated to the Zionist youth movements. So now we were colleagues. I came to my task with the energy of youth and lots of big ideas; Yehoshua ran a smaller place and knew every file; he also knew many of the people, places, and the events, in a way I never could. We were friends, but in a very unequal way. If you ever have two or three spare days, you should go to Yad Vashem and watch Yehushua's 8-hour video testimony about Slovakia, and Auschwitz, and death marches. It's a tape of a man in his sixties, with the mein of a confused and uncomprehending boy, unable to understand the story he was telling, or unable to believe it, or make any sense of it. This, from the man who had uncovered an entire branch of the SS. Offhand, I don't think I ever saw him not smiling, in an unassuming, slightly embarrassed way. Nucho Eden, may he rest in peace. The IAEA has just published its semi-annual report. Apparently, it doesn't say anything. It is no secret that there are disagreements over the report, and Haaretz has reported more than once that ElBaradaei's deputy, Olli Heinonen, would like the reports to state unequivocal facts. However, as is common in an international bureaucratic organization, efforts are being made to maintain the impression of unity, with differences being kept under wraps. Gaza: Is It Starting Again? The Palestinian Maan news agency reported on Saturday that the Israel Defense Force fired artillery rounds at gunmen at the central Gaza Strip. No injuries were reported. The IDF said in response that no such attack took place. In cases such as this you can't even apply the "One man's terrorist is another man's freedom fighter" logic. How would it work? "One man's artillery shell is another man's no-artillery shell"? How about one man's lie is another man not lying? It sort of lacks the pleasing balance, that one. There has just been a birth in the Californian branch of our family. I called the new father to say mazal tov and he described how at the last moment there had been various complications, but everything is alright. So, he summed up, since you've been mentioning healthcare on your blog, Yaacov, you might want to mention that my vote is for the system. It works well. (Actually, I think he was talking about the system before it changes, i.e. as it already is, so his point may have been different than he meant - but I really don't think this is the moment in his life to be quibbling about politics. His agenda at the moment is way above politics). Then there was Dennis who slammed into me last week, going so far as to call a post of mine that mentioned healthcare, a travesty. You rightly criticize those of us here in the United States for doing not understanding the complexities of the Israel/Arab/Palestinian conflict. But you do the same thing when you say that you are agnostic on "who's right and who's wrong, who's fibbing and who's fibbing more. "Don't mean to be harsh, because I read you constantly but you have this wrong. In between Dennis and the new father, I had a chat the other evening with a fellow who lives here but works as a physician in the States (you'd be surprised how many such extreme commuters there are). He told me that philosophically he's all for revamping the American health system, and would even be willing to take a financial hit if it would be for the general good, but in his opinion nothing being discussed right now will make things any better, and probably they'll get worse, though he expects his income to remain unaffected. This blog is not about American health care. It's mostly about Jewish stuff, though from time to time I jump around. Yet it occurs to me that the healthcare metaphor really can be useful, precisely because it demonstrates how impossible it is for an outsider to really understand what's going on. I have no doubt that were I was prepared to spend six solid months studying the matter I could form an educated opinion, unless I'd need 12 months, or 24. If I didn't think so I couldn't be a historian, since historians have the fundamental conceit they can understand times and places they've never been to. Yet short of dedicating oneself totally to really understanding, I'm here to report that following the media doesn't work. These folks swear by their narrative; those folks swear by the opposite one. These chaps admonish that there's an imminent danger; the other blokes shrilly warn of a whole different set of apocalyptic threats. These guys quote statistics; the other ones wave different ones. Somehow there are Nazis involved on both sides of the argument, though I haven't been able to figure that out at all. Not to mention that the single most important part of the story is not visible through the media at all: what's it like living in the system? I don't mean, which horror stories each side trots out. I mean the regular living part of the story. What's it like right now to live in the present system, what's wrong with it, and how ought it be different. What do you do when your kid has the sniffles? When she has something worse than sniffles? When, heaven forbid, she has something radically worse than sniffles? How does it work? What decisions need to be made, by whom, under which constraints? This type of understanding cannot be had merely by following the media. Can't. and do a spot of reporting. 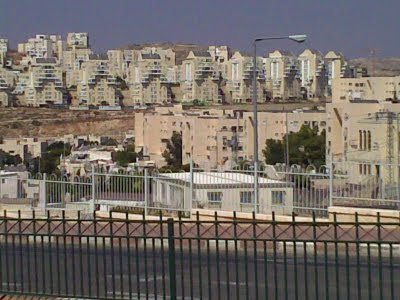 The town was founded in 1990, just over the Green Line, to offer unexpensive housing to large Haredi families from Jerusalem and Bnei Brak. It was originally called Kiryat Sefer. At the end of 2008 it had a population of more than 41,000, making it the largest settlement on the West Bank. The weekly birthrate is 45, or 2,500 babies annually, which makes for a lot of children. A lot of bycicles, too. The annual growth rate is 9.5%, which means that in the six months since Obama demanded that Israel stop building on the West Bank, the population of Modi'in Illit as grown by about 2,000 people. This requires additional housing. The town is wedged between the Green Line to its west, and the security fence on its east; in the long run the growth will have to be westward since there will be no construction beyond the fence. In essence, Modi'in Illit is a border town. Israel may swap its equivalent for land elsewhere, but I don't see any scenario in which the town will be evacuated. Pretending otherwise will not help peace negotiations,which will by definition be based upon false assumptions. A group of apparently British folks has launched a blog/website called CiF Watch. They have set themselves the goal of holding the Guardian to account for the antisemitism routinely spewed by its writers at Comment is Free and in the moderated comments section beneath each article. They have clearly done their preparatory work. See for example their survey of the various authors and their opinions as expressed so far, and their page about some of the commenters. Will they succeed in holding the Guardian to account? No. Will they even be noticed? I hope so but am not holding my breath. Will they manage to preservere at the odious task of regularly reading CiF? That depends on how masochistic they are. Still, if they do, their effort will at least serve as a valuable resource. that we raise, we have regretfully decided to remain anonymous. I'm not a fan of such decisions. They don't live in Hamas-controlled Gaza, or Iran, or Egypt, or Syria, or all the many other places in the world where it's dangerous to have an opinion. And if they do, why stay there? That one issue aside, however, they look like a group that should be encouraged. All you need do is bookmark them. 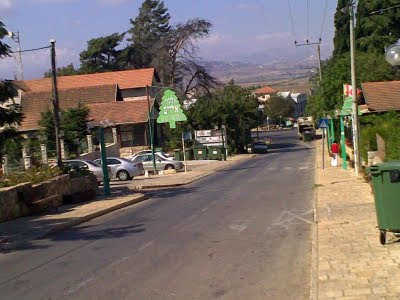 Metula, earlier this week: view of the main street taken from the center of the village. The white structure at the bottom of the block is a packing house; the fence behind it is the Lebanese border. The fields beyond it and the mountains beyond them are Hezbullah territory. Yet it wasn't always so. Here's my report. One compelling justification for democratic nationalism is that it requires the nation to organize its affairs according to its values and priorities. Witness the American discussion about healthcare this summer; a national conversation about society, responsibility, life and death and how best to balance them. Each nation has its own set of laws that reflect its own discussion; were there a single, right way of organizing human affairs, it might long since have been adopted everywhere. (Or not. People aren't always sensible). It was ever thus. Take the 3rd century as an example. Still reeling from the double calamities of defeat and destruction at the hand of Roman legions in the two previous centuries, there was yet a vibrant Jewish presence in the Galilee doing its best to hang on, and its laws reflected its conditions. Here's a small example. A second-century Mishna moots the ownership of olive trees swept downstream by a flood from one man's grove to another's field, where they took root. Third-century Rabbi Yochanan ruled that they were not to be repatriated, forbidding the uprooting of olive trees "mishum yishuv Eretz Yisrael", because of the need to settle the land of Israel. Rabbi Yirmiya added that this ruling was so compelling it overrode all other considerations. (Baba Metzia 100b and 101a). Their efforts were only mildly successful. A few pages on the discussion is of standards of fertility to be expected from a field of wheat. Rabbi Yochanan says four se'ah of grain is needed to reap one kor; Rabbi Ammi says it takes eight se'ah. An old man explained to the scholars that in Rabbi Yochanan's day the land was still fertile, but by Rabbi Ammi's, conditions were worsening and good harvests were rare. (Baba Metzia 105b). Over the next few centuries the land degraded and the Jewish population dwindled. Sometime in the early 19th century a Jew from Russia named Bronstein arrived in Safed, largest of four significant Jewish communities (the others were Tiberius, Jerusalem and Hebron). I can't tell much about Bronstein, since no-one remembers, but we can safely say he didn't see any political significance to his move. He lived in a large multinational empire dominated by Russians, and was moving to another large multinational empire, dominated by Muslims. He was a Jew who saw an opportunity to move to Erez Yisroel and that was enough. A great grandchild of his, we'll call him Levy, was an enterprising artisan. Yet Safed in the 1890s didn't offer much, so when he heard that the Baron Edmond de Rothschild was recruiting settlers for a new agricultural settlement, he signed up. No-one intended to launch a new chapter in Jewish history. The program was meant merely to create economic viability for Jewish existence. That it would be part of something greater became obvious only later. In 1896 Levy, his wife and children, and a few dozen other families settled on a plot of land purchased by the Baron northeast of Safed on a low hill above a broad valley; to the east a gurgling creek ran through a canyon and tumbled over a high waterfall before flowing south into the swamps of the Hula valley. They called their settlement Metula. Though they had no experience and very little guidance, the settlers of Metula planted apple and olive trees on the rocky plots behind their huts, and grain on the broad fields in the valley to the north. They worked hard; some gave up while others persisted. Levy's sons brought brides from Safed and set up their own families. The agricultural environment hadn't improved since the days of Rabbi Ammi. If anything, it was worse. Yet the trajectory had changed and these peasants were clawing back, not slipping. They continued not to see themselves as national harbingers. When one daughter had a tumor her mother took her to the hospital in the big city: Beirut. When the doctors couldn't save her she was buried there. If there's still a Jewish cemetery in Beirut, she lies in it. Another time there were skirmishes between warring local factions, and one of Levy's sons sent his wife and newborn twin sons across the mountains to shelter in the Jewish community of Tyre. One of them died on the road, and is buried in the Jewish cemetery of Tyre – which almost certainly no longer exists. After World War I the French and British carved up the defeated Turkish Empire. The area around Metula was so remote it took two extra years to finalize the border, which was drawn so that the village was the northernmost tip of the British Mandate. So northernmost that the border ran a literal stone's throw from the last house; the fields in the valley were all in the French Mandate. It took another few years to agree that the Jewish farmers in Mandatory Palestine would be permitted to work their fields in Mandatory Lebanon; an international checkpoint was set at the bottom of the hill between the homes and fields, and the farmers crossed it every day. This arrangement was respected until the State of Israel replaced Mandatory Palestine and the Lebanese blocked access to the fields. Even then, the eldest of Levy's grandsons, a towering giant of a man, used to break through the border each spring, drive his tractor to the family's fields, and plow one furrow. These fields, he was saying, had been his grandfather's, his father's, and he wasn't relinquishing title merely because of some international border that someone had drawn. A grandson of Levy's was killed in Israel's War of Independence. A great grandson was killed as a paratrooper in the early 1960s, and another in the Yom Kippur War. Yet they're a hardy stock, are Levy's descendents. Almost 200 years since the first Bronstein left Russia for Safed, and 115 years since he and his wife set off for a barren hill above the Hula, some descendants are still there. They've long since accepted the loss of the fields in Lebanon, but they still farm the orchards and press olive oil. Levy's surviving grandsons are in their eighties and nineties, and you can still find them in Metula, living on the original short street. Where once a checkpoint was today stands a fruit packing factory, and the fence behind it is a sealed border. The great grandchildren and their children are spread far and wide: there is at least one great great great grandchild in New York, but most are Israelis. They span the political spectrum from settlers to far-left activists; there are lawyers and doctors and metal workers and hoteliers and dreamers; one is a property magnate with global reach, another works on a dairy farm on the West Bank. When I visited last week one descendant was drawing up plans for a new commercial initiative better adapted to the 21st century – but still in Metula. Jews used words and ideas to preserve their bond to their land. The essential bond itself, however, not the idea, is expressed in deeds. Harvesting olives is a reality and a metaphor. Seventeen centuries ago the harvesting couldn't stave off the general deterioration. A hundred years ago it was essential in launching the revival. The other day one of the men told me of a chore he had, and asked if I'd join him: the extra two hands would make it easier. It was late afternoon, when the fierce sunlight of an August midday eases into gentle golden rays. Together we mended a fence, pulling, tugging, reinforcing, as the men have been doing for more than a century. Half a mile from the Lebanese border; it was comforting and peaceful. Thanks for the initiative, Norm! Have a look at this face: That's Jan Helin, and he's an antisemite. He's not even a particularly interesting antisemite, with some novel angle that gives you pause or forces you grudgingly to recognize his intellectual innovation. This fellow, he just regurgitates stale old canards and lots of very worn clischees. Helin, in case you don't already know him, is the editor of Aftonbladet, the Swedish Guardian-lookalike that last week published the sickening pack of lies about how the IDF kills Palestinians so as to harvest their organs. Lest you thought it was an editorial oversight, a few days later Helin published a second story, by a different reporter. Or rather, it's the same story, only repeated by a different journalist. Netanyahu is responding as the Prime Minister of the Jewish State should. By demanding the Swedish government condemn the rot. He's perfectly aware of the issue of freedom of speech, is MIT-educated Netanyahu, and he's not demanding the Swedish rag sheet be shut down, say, or its editor burned. Other folks do that sort of thing, but not the Jews. What Netanyahu is demanding, and right he is, is that the Swedish government condemn the allegations for the unaceptable lies they are. In democracies people may lie, of course; and others may condemn them. Talking about violent demonstrations with burnt effegies and embassies, the Jews of Sweden responded true to European form: by wistfully wishing the Israelis wouldn't make such a fuss. How unsurprising. When you're a Jew committed to living in a society that is saturated with hatred of Jews, you do your best not to make waves; this has been one of the major Jewish responses for centuries. (Not the only one, of course). Helin apparently gave an interview to Y-net, and was so uneducated about his topic that he trotted out one of the oldest canards in the book: some of my best friends are Jews. Helin said he had not meant to hurt anyone. "I was naïve," he said. "I thought Israel was democratic. I have many Jewish friends and I see Jewish culture as very positive." Neat, isn't it? I thought Israel was a democracy; now I know I was naive. There's more there; you really have to read the entire interview to see how effectively the man's Weltanschuung protects him from accepting any wrong-doing, even things like publishing baseless allegations with nary a sliver of evidence, because "the claims exist so we published the story". Back to his picture: gaze at it, and ponder. He looks like a nice man. His collar is open and informal. He seems the kind of person you might enjoy having a beer with. He's the editor of an important newspaper, so he must be educated and intelligent. Were you to seek the villain from a row of mug shots you'd never choose him. And yet he certainly is a villain, in a malicious though unintelligent manner, hate infused and barbaric. Keep that image in mind: appearences can be totally misleading. Antisemties can look like nice and be highly educated. Powerline has a post (many, actually) about everything wrong with Obama's health plans. I remind you that I continue not to be a part of that discussion, tho I am finding it to be one of the best political shows in town. I don't know who's right and who's wrong, who's fibbing and who's fibbing more. The reason I note this particular post is that while poking fun at Obama, the author uncovers one of the most fundamental flaws of journalism and political discussion of our age (and that's saying a lot, given the number of contenders). Still, the push for health care "reform" is in one important way, as your title states, a recklessness borne of arrogance -- or if not arrogance exactly, then of the echo-chamber quality of a liberalism that can no longer hear the outside world or, increasingly, itself. This is again related to the way Obama campaigned and has governed. The fact that big majorities are satisfied with the health care system in general and their care in particular just does not register with him. What registers are the Queen for a Day stories -- the cancer-stricken granny whose insurance company cuts her off three days before chemotherapy was to have begun, etc. Set aside the Obama-specifics, which may or may not be an accurate depiction, and concentrate on what he calls the Queen of the Day stories. My experience has been that many people who work in journalism believe that complex issues can and should be boiled down to the specific human faces upon which they impact. Forget all the complicated stuff and look at this one lady, or this suffering young girl, or the heartrending story of these poor folks. Context, perspective, accuracy, even simple old-fashion veracity, these are all set aside in the rush to show the human face of the abstractions. The result is pretty much what you'd expect when you systematically replace intellectual rigor with tear-jerking spectacle. I'm back. I picked up a fascinating story which I need to write up; I hope I'll be able to post it tommorow. In the meantime, here's a couple of interesting tidbits. Ever heard the one about how Israel's Arabs are Apartheided against and all that? Take a look here: someone made a list of the top achieving highschools in Israel and divided them by sector. The sector with the most top schools (40%) is the modern orthodox. No suprise there, it's been that way for years. The Haredi aren't on the list at all, of course, since in the best case scenario they don't much care about preparing their daughters for national level matriculation examps; the boys don't study for them at all. The secular sector, by far the largest demographic, has only a quarter of the top achieving schools. One third of the top achieving schools are from the Arab sector, who make up about 20% of the population. Then, over here, we've got a story about some Catholic leader who wrote a document which managed to unite all the major strands of American Judaism - a major feat, that - in rejecting him. Apparently they feel the document implies an expectation that the Jews will become Catholics. I'm a bit surprised, since by and large the relations between American Catholicism and American Judaism have been quite good these past few decades, but if anyone thinks the Jews will end up being Catholics, well, I'd say that past experience ought to dampen their expectations. I don't expect to be blogging until Monday or Tuesday. It's August. Feel free to visit Mondoweiss. By all accounts life for the West Bank Palestinians is improving dramatically. And, to put it mildly, it's not improving in Gaza. This, in spite of the fact that in Gaza there are no settlements, and no Israeli presence. Meanwhile, the IDF is still present in parts of the West Bank, the settlers are still there, and to a very limited extent they're even still growing. Way back in March Norman Geras parodied Caryl Churchill's antesemitic screed Seven Jewish Children. I sheepishly admit I missed it back then, and only found it now because of ikibbitz. Anyway, Norm's piece demonstrates that even blogs can sometimes have lasting value. Read his whole thing. Matter of fact, you might simply want to read Normblog regularly. Irwin Cotler, a world famous professor of law and a previous Canadian Minister of Justice and Attorney General has a two-part article about the Goldstone commission which is preparing a report on the Gaza operation for the United Nations Human Rights Council (UNHRC). Given the client for whom the report is being written, it's no surprise to learn that the verdict was written before the investigation, and enshrined in the mandate of the investigation. Indeed, the mandate that was handed over to Goldstone was deeply one-sided and flawed, by his own admission. For the resolution of the UNHRC creating the mandate already served as a direct indictment of Israel - it began by "strongly condemn[ing] the ongoing Israeli military operation… which has resulted in massive violations of the human rights of the Palestinian people and systematic destruction of Palestinian infrastructure." Canada, Japan, France, Germany, Italy, Switzerland and the United Kingdom - among others - accordingly refused to support it. Former UN High Commissioner for Human Rights Mary Robinson stated that "the resolution is not balanced because it focuses on what Israel did, without calling for an investigation on the launch of the rockets by Hamas. This is unfortunately a practice by the Council: adopting resolutions guided not by human rights but by politics. This is very regrettable." Asked to head up the mission before Goldstone, Robinson refused. Notably, one Professor Christine Chinkin accepted the appointment. Now Chinkin joins Goldstone in an inquiry that bears the hallmarks of bias and politicization that he supposedly shunned. Indeed, before the mission began - as if to add insult to injury - Chinkin notoriously signed her name to a public letter that was titled "Israel's bombardment of Gaza is not self-defence - it's a war crime." Why she feels qualified at this point to hear witness evidence along with the rest of the commission - without triggering a reasonable apprehension of bias - is not entirely clear. Cotler, being who he is, has no problem with inverstigations into Israel's actions. So long as they're reasonable. None of this is intended to suggest, nor would I wish to have it inferred, that Israel is somehow above the law, or that Israel is not to be held accountable for any violations of law. On the contrary, Israel is accountable for any violations of international law or human rights like any other state. The Jewish people are not entitled to any privileged protection or preference because of the particularity of Jewish suffering. But the problem is not that Israel seeks to be above the law; it is that Israel has been systematically denied equality before the law in the international arena. The issue is not whether Israel must respect human rights, but that the human rights of Israel and its people have not been respected. The discrimination emerges not from suggesting that human rights standards should be applied to Israel - which they must be - but from the fact that these standards have not been applied equally to anyone else. There's a lot more in there. I recommend reading the whole thing. And of course, bookmark it for the near future, when the report gets published to international fanfare of the antisemites. A leading Swedish newspaper reported this week that Israeli soldiers are abducting Palestinians in order to steal their organs, a claim that prompted furious condemnation and accusations of anti-Semitic blood libel from a rival publication. "They plunder the organs of our sons," read the headline in Sweden's largest daily newspaper, the left-leaning Aftonbladet, which devoted a double spread in its cultural section to the article. (Click here for the original article in Swedish). A rival Swedish newspaper attacked the report for what it is. Pure and unadulterated (and ancient) antisemitism. Still, the paper that published the story felt confident enough to publish it, probably knowing there's a public out there that likes such fare. Gerald Steinberg, whose business is to know all about NGOs, explains why this is standard fare in Sweden these days. Update: Barry Rubin has dug up the interesting fact that the editor at the Swedish newspaper responsible for this libel is no innocent bystander. When asked earlier this year what she would wish for more than anything she responded "That's easy. I'd wish for a free Palestine". So would I, tho it's not at the very top of my list, merely in the upper third, say. But I don't live in Sweden. Also, I'm aware the top culprit for the Palestinians not having a free Palestine is their preference for a no-Israel. Somehow I don't think that's what Ms. Linderborg had in mind. Update: Gerald Steinberg says the Swedish government regularly funds NGOs which say this sort of thing. And Jonathan Tobin tells about Swedish parliamentarians who essentially support the reporters right to publish libels. Byron York has some numbers to demonstrate that a crowd of people who cared deeply about some bad wars until recently have now decided they don't really care anymore. What happened to cause the change? Did the wars change significantly? Were they unjustified but now can be justified? Hardly. The President associated with them changed, that's all. When it was George Bush, the wars in Iraq and Afghanistan were burning issues. When it's Obama, they're uninteresting. This isn't particularly surprising. It's human nature. Still, it's a pattern I often point out on this blog, which deals mostly with Israel. People trot out objections to Israel's wars not because they care about the wars, but because they object to Israel. This means there are two separate tactics needed when confronting such people and their claims. First, rebut their facts. Second, recognize that they aren't talking about facts at all, but about sentiments; while these are harder to combat (how do you dispute a sentiment? ), their power over third parties could possibly be whittled down somewhat. Honestly puzzled observers may not like to see themselves as the dupes of other peoples' sentiments. (hat tip for the link: Powerline). Guy Bechor is a knowledgable but slightly contrarian interpreter of Middle East affairs. He thinks Israel has re-established its deterrence in the region. The calm of this summer would indicate he's right. If we're back at war in three months he'll have been proven wrong. The outcome retrocatively determines the veracity of the endless chatter about the proportionality of Israel's methods of war waging. If military measures achieve the goal they were intended for, it's a bit hard to say they weren't proportional. If they don't, they must have been less than proportional. Historians looking back at distant events have the advantage of knowing how they played out; which things that seemed crucial at the time had no long-term significance whatsoever; and who "got it right". Then again, historians see only a small portion of the reality the living actors operated in, and this sanitizing of the past and Darwinian winnowing out of all unimportant facts can of course severely hamper historians' ability to understand what was going on. Contemporaries have a different set of problems in understanding their reality. Besides not knowing what will prove significant and what is merely chaff blowing in our eyes and obscuring our vision, there's also a lot going on that we don't know about. Or is there? And what is it that we don't know? Roni Sofer claims to know of a de-facto Israeli acquiescence with Obama's demand to cease construction in all settlements, even in East Jerusalem. The agreement is for six months only, so as to give the Americans time to prove the viability of their track (or its non-viability, I might add). 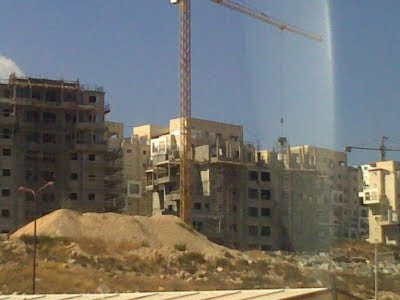 It has already started, Sofer tells: the Ministry of Housing has not authorized any new construction projects in any settlements since the elections. The Minister of Housing is Ariel Atias of Shas, and reportedly is at the heart of the decision in spite of the contradictory posturing of Eli Yishai, the boss of his own party. The settlers are all in an uproar, predictably, though this proves only that their politicians have identified an issue that offers them some publicity, that lifeline of politicians everywhere. Or maybe it proves there really is a freeze on construction? After all, they wouldn't be kvetching so loudly if the facts themselves were wrong, would they? Politicians wouldn't do that, would they? You might be interested to notice, by the way, that our internationally-touted "far-right-almost-fascist-evil-settler" Avigdor Lieberman isn't participating in this particular circus. You may infer whatever you wish from that. Egypt's Mubarak, meanwhile, has a meeting later today with Obama in Washington, and an Arabic newspaper in London claims there's a deal in the making (says Y-net. I don't read Arabic). Egyptian President Hosni Mubarak and his American counterpart, Barack Obama, are expected during their White House meeting Tuesday to discuss "an initiative of leaders" for resolving the Arab-Israeli conflict in the Middle East, in which the Palestinians will waive the right of return in exchange for compensation, the London-based Arabic-language al-Quds al-Arabi newspaper reported Tuesday. According to the report, the same initiative includes amending the 1967 borders in a way which has not been detailed, as well as the establishment of a demilitarized Palestinian state, with Jerusalem being the joint capital of both states. If true, this means the Egyptians have accepted Netanyahu's terms for peace, or most of them. Palestine will be demilitarized, and no Right of Return; if this is coupled with a clear Palestinian acceptance of End of Conflict, meaning no additional claims can be made, the essence is very close to the demand for Palestinian acceptance of Israel as the Jewish State. Only on the matter of Jerusalem will Netanyahu have to change his declared position. No one seems to be claiming the Palestinians will accept this package. According to the newspaper, commentators estimated that Mubarak's meeting with the Jewish lobby is a manifestation of the warming relations between Egypt and the Netanyahu government, which have been expressed in a series of issues in recent months, including allowing Israeli submarines to cross the Suez Canal and Prime Minister Benjamin Netanyahu and President Shimon Peres' visits to Egypt. Regular readers may remember that I was very approving of the decision to name Michael Oren as our ambassador to the US. Here's vindication in a WSJ article about how things are getting so much better in the West Bank. The West Bank's economic improvements contrast with the lack of diplomatic progress on the creation of a Palestinian state. Negotiators focus on the "top down" issues, grappling with legal and territorial problems. But the West Bank's population is building sovereignty from the bottom-up, forging the law-enforcement, civil, and financial institutions that form the underpinnings of any modern polity. The seeds of what Israeli Prime Minister Benjamin Netanyahu has called "economic peace" are, in fact, already blossoming in the commercial skyline of Ramallah. The vitality of the West Bank also accentuates the backwardness and despair prevailing in Gaza. In place of economic initiatives that might relieve the nearly 40% unemployment in the Gaza Strip, the radical Hamas government has imposed draconian controls subject to Shariah law. Instead of investing in new shopping centers and restaurants, Hamas has spent millions of dollars restocking its supply of rockets and mortar shells. Rather than forge a framework for peace, Hamas has wrought war and brought economic hardship to civilians on both sides of the borders. Rational and informed observers (that sort of narrows the field, I'm aware) will have to notice that when Israel is faced with a reasonable Palestinian partner it behaves one way, even as it behaves another way when faced with an unreasonable Palestinian partner. Someday this ought to strengthen the perception that Israel, even under a right-wing government, would eagerly welcome a peaceful prosperous sovereign Palestinian neighbor; moreover, the Palestinians can impact Israel's positions. Peace seeking Palestinians will encounter different Israelis than war mongering ones. Israel's GDP rose very slightly (1% at an annualized rate) in the 2nd quarter of the year, following two quarters of contraction. I think we need to acknowledge that warfare is indeed changing since Israel's inception. But all I'm sensing here is disgruntled complaints about how it's not fair that Israel can't play by the older, more barbaric set of rules. Or how other countries can get away with it, but Israel can't. Suggesting that we lower the bar for Israel, not raise it for other countries, strikes me as wrong.There is a necessary adaptation to a new contemporary understanding of war that the world must make. Changing our international laws of war to account for guerrilla terrorism is part of that. But at least America's public voted down Bush's version of the answer. (And largely Israel's answer, by similarity.) I also think it's fair to say that Israel can't be sympathized with for trying to fight an unjust war justly. Having done work in the territories, I can say that I don't need the majority voices to tell me that what goes on there is unacceptable. I have eyes, it's pretty plain to me that settlement expansion and a majority of the security barrier are not for security at all. There is no just war Israel can fight until the occupation is over. And I feel comfortable with that. Kung Fu blogs at Judaism Without Borders. So here's my response. Israel plays according to the laws of war. It is more scrupulous about it than any other country, as I document on this blog with regularity. The problem with the criticism of Israel which pretends to be based on international law is that it isn't. It's based upon an imaginary version of international law – and yes, this imaginary version is not used for any other country. This is hypocrisy and antisemitism, both. America's public is just fine with the fact that its own way of waging war is far less scrupulous about the laws of war than that of Israel, again a point I make regularly on this blog. Moving from the Bush to the Obama administration has not changed this. Collateral damage is acceptable to Americans to a degree Israel would never dream of; Obama has no intention of changing this because it's the American way of war, though in Afghanistan at the moment the Americans are beginning to be more careful: for tactical reasons, not moral or legal ones. Settlement expansion in the West Bank is far more limited than you think. The security barrier incorporates less than 5% of the West Bank. Moreover, it has proved to be wildly successful in saving lives. The war isn't about the occupation. Israel offered to disband most settlements and end the occupation in July 2000 and the Palestinians answered with a wave of suicide murders. Israel unilaterally ended its occupation of Gaza in 2005, and the Palestinians answered with thousands of rockets at civilians. In both cases the Palestinian violence eventually ended when Israel responded with effective violence, thereby proving that its reaction had been proportional to the threat – which takes us back to international law. The war is about Israel's right to exist. Even prominent Palestinian apologists such as Agha and Malley now admit this. The Palestinians, to give them credit, never said otherwise. Never. Our problem was that we weren't listening to what they were saying quite openly. I got a bit of flak for writing about the American health care issue, which must have raised my appetite for more. How else to explain my decision to talk about health care in Israel? I'm aware - believe me, I'm aware - that Israel is smaller than the US. Why, the whole country has less of a population than the larger American cities, its geographical size is smaller than some of the American metropolises, and I'm not even talking about Houston which is slowly swallowing all of southern Texas. (Which raises the interesting question why Israel so fascinates most of the world, while Houston merely gobbles up the surrounding plain. You'd think we were a superpower). I also recognize that America has three or four separate layers of government while all we've got is one, and even that one is rather inept. So I'm not saying what works in Israel might work in the US. Probably not. This post is merely to be informative, and you needn't jump down my throat. Israel has a social security system (bituach leumi) which serves as a safety net for various things. If you can't work for a while because of health matters it kicks in. If you're permanently disabled. If you're called up to reserve duty but would like to keep on getting your salary. if you've got children under 18 it pays you a monthly stipend. It even ensures a minimal pension once you've reached 65 0r 67 (women or men) though no one could live off it. And it offers many additional useful things. In return, every adult after military service must pay a tax of a few percent, depending on income, and employers also chip in; if you're a student or unemployed you still have to pay something like $50 a month. 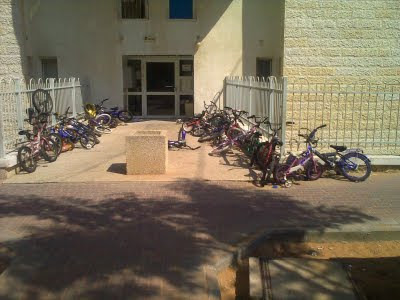 It's nice to have, bituach leumi, it doesn't abolish poverty or anything of the sort, and all Israeli citizens have it. Even the Arabs of East Jerusalem who are somewhere between citizens and permanent residents have it- a word about them later. About 15 years ago we also got universal heath care, though for many of us the difference from our prior condition was not dramatic. The universal tax for this is similar to the social security one, which means that the middle class pays about 5% for each, totaling 10% beyond income tax. Or more accurately, before income tax, since everyone pays, while some 50% of workers don't pay income tax. In return for the tax, everyone must be a member of one of three Kupot Holim, which are exactly like HMOs but different. You choose which one you wish to join, and every six months there's a period when people are allowed to switch. The kupot are not allowed to turn you down. There aren't major differences between them by now (there were back when the law was first passed); each has slightly different nuances of service, and some have better infrastructure in different parts of the country. (The one we're in apparently offers fewer doctors outside of Jerusalem, I'm told). You more or less choose your doctors from a list; many doctors are on all lists. Medications are available for a small fee, which means expensive ones are essentially free. Each visit to a specialist (not a GP) is taxed at 18 NIS, or about $5. The types of lab tests and procedures you're likely to need in a normal state of health short of catastrophic ailments are mostly covered; sometimes you need to haggle a bit with the system, but at an acceptable level. All of this is determined by the government. There's a committee of specialists which determines what the universal coverage is, and updates it annually; the government then has the final say. Some years there's a public outcry because some expensive new medicine isn't yet on the list; in most cases it then will be sooner or later because politicians like happy voters. The universal coverage is called Sal Briut - the basket of health. We're as good as anyone with euphemisms. The sal briut isn't bad, but it's far from perfect. So each Kupa offers supplementary plans, which cover additional stuff. These plans aren't very expensive, though if you want the full monty and have a largish family it does accumulate. Middle class folks, so far as I can tell, all have the full supplements. Once you do, you really are covered to a reasonable extent, even in case of catastrophes. There can be waiting lines but not anything a Briton wouldn't find an improvement to their NHS. If you activate the supplemental coverage even those can go away, unless you want a specific procedure with a specific surgeon who only works 32 hours a day and can't fit you in right now - but you could go to a different specialist. I've accompanied a family member through cancer treatment a few years back (she's fine, thank God), and the Kupa did make a mild hassle about this medicine not that one, but it was a hassle for us; the patient got the treatment she needed and there was never any doubt she would. A colleague a few years ago needed a brand new medicine that had just appeared on the market so her family bought it; a year later it was already in sal briut. People I know who enjoyed top-notch American health care tell me what they had was better than what we have; mostly they seem to be talking about the bureaucracy of being ill. There's no Mayo Clinic in Israel, and indeed some procedures at the very top of the profession can't be had here. (They can't be had in Kansas, either). But not that many. As a general rule, it's probably better to be ill here than even in most of the developed world, and certainly no worse. Israel-Palestine conflict: can't have a post without that, can we. You did notice that I said all Israeli citizens enjoy sal briut coverage, and I'm not going to add the obvious. It's needless to say. Foreign workers, not being citizens, aren't covered; it's my understanding that if they're here legally their employers are supposed to insure them; if they're here illegally, not. There's an organization named Physicians for Human Rights. On the Israel-Palestine topic they're about as anti-Israel as you can get, but they also deal with health issues of foreign laborers, and you've got to admire them for that. East Jerusalem's Palestinians. If they claimed Israeli citizenship before the late 1970s, they're Israelis. A large majority of them didn't, so Israel unilaterally foisted permanent residency on them, and gave them bituach leumi and health care. One of the best kept secrets of the Israel-Palestine conflict issue is that each time anyone seriously talks about partitioning Jerusalem, the Arabs of East Jerusalem get a strong case of jitters. A Palestinian state would be a great thing to have, and they agree East Jerusalem must be in it, but relinquishing Israeli social security and health coverage is something no sane person would want to do. Which is one reason some theorists of human-rights-as-a-way-of-sticking-it-to-the-Jews now claim that even once Israel leaves East Jerusalem, it must continue to pay for the locals' health care until the end of their natural life span. I spoof you not. Ethan Bronner has a forgettable article in yesterday's NYT, about how things look good in Israel these days but the Israelis are worried. Or rather, that's what the first four fifths of the article says. Near the end it veers off in the opposite direction when he approvingly cites Aluf Benn in Haaretz last week, who posited that when Israelis feel secure they see no reason to make compromises for peace. (That wasn't my reading of Ben's article, but I see how Bronner could have read it that way). record number of travelers in the first week of August. The currency is so strong that the central bank has bought billions of dollars to keep the exchange rate down. So Israel has managed to beat off its many foes, once again, but it still feels threatened. Perhaps because the foes are still there, nursing their wounds and brooding over their thwarted plans to get rid of us. Which is, in a way, the thesis of the unlikely Hussain Agha-Robert Malley duo, in their NYT op-ed of two days ago, or, as Jeffrey Goldberg describes it, in the latest of "their never-ending series of provocative and thoughtful op-eds". Agha-Malley, in the unlikely case you've never heard of them, are the fellows who double-handedly saved the day for the Palestinians and their myriad appolgists at the height of their war against school-children and bus riders earlier this decade. At the time Bill Clinton's rueful but public recognition of the fact that it was the Palestinian side that had thwarted peace, was forcing the more sane among Israel's haters to admit weakness in their case. Then, in August 2001, Malley and Agha published a seminal article in the New York Review of Books which claimed that actually, no. Ehud Barak had been mean to Arafat; he hadn't really intended on letting the Palestinians have anything; and while Arafat's negotiating style wasn't pretty, the talks failed because of the Israelis. Any number of well-informed people refuted this narrative, including Malley's boss Bill Clinton, but facts interest Israel's enemies only to the extent they can be used against it; otherwise they're not important. Jonathan Tobin has more on this here. Perhaps they're incorrigible contrarians; perhaps they derive special pleasure from poking American Presidents in the eye. Whatever the motivation may be, over the past year the duo's line has been inching towards an acceptance of reality. In this week's op-ed the factual part of their analysis is roughly the same as mine is, believe it or not. refugees’ rights, the heart of the matter is not necessarily how to define a state of Palestine. It is, as in a sense it always has been, how to define the state of Israel. state , but they should state it if they believe it. Whether Agha-Malley come out and say what they think or not seems to me less important. Why do we need to care about their personal opinions? Jonathan Tobin's point is more important. Though many will dismiss this piece as extremist fare, Malley has a history of being the thin edge of the wedge when it comes to anti-Israel polemics. Though the authors couch their article in terms that allow them to pose as peace advocates, what Agha and Malley are attempting to do is legitimize the theme that peace depends on the end of the Jewish state even within the 1949 armistice lines. The lines of discussion are indeed becoming ever more clear, even if the team at the White House doesn't see it. The issue is the right of the Jews to sovereignty in their ancestral homeland. Not the right of the Palestinians; that has already been acepted by any fair minded person. It's the right of the Jews which is being discussed, evaluated, and in many cases rejected. This is what the Jews need firmly to keep in mind. Barry Rubin analyzes the results of the Fatah conference by taking a close look at each of the 18 members of the new Central Committee. He's not bowled over with optimism. I don't know if he's right. On the one hand, he kows a lot more about this than I do. On the other hand, I remember watching Mikhail Gorbachow, back in the old days, doing precisely not what any of the experts said he would do, so I'm wary of experts knowing stuff in advance. But it is refreshing to see what an expert can do. Have a look at his piece, then tell me when was the last time you saw any analysis of anything about the Palestinians that was remotely as well-informed as this? You know what? Tell me if you know of any Western journalist who even knows all the names of these fellows. Adam Serwer thinks some American Jewish pundits are using identity templates borrowed from the African-American experience. Apparently he's being derogatory. I don't know enough about it to comment one way or the other, but I'd like to draw attention to some peculiarities on the edge of his argument. The first is his thrice repeated allegation that Netanyahu called David Axelrod and Rahm Emanual "self hating Jews". This is very important to Serwer, and he gets quite worked up about it. Of course he has no source for the statement; nobody does. It's a cannard which fits lots of peoples' idea of how things should be, irrelevant of whether they are or not, and so gets repeated so many times it acquires the immunity of an article of faith. Netanyahu's office has denied he made the statement (no, I have no link. It was on the radio). Also, contrary to what the media tells you, had he said it it would have been uncharacteristic of him, but as we say in Hebrew, try to prove you don't have a sister. In the blogosphere, conservative Jews have a term for a group of prominent liberal Jewish bloggers who have been critical of Israel’s behavior in the region: the “Juicebox Mafia.” Two weeks ago, Jamie Kirchick, a blogger for Commentary and The New Republic, wrote that the “Juicebox Mafia crew” was motivated by “a visceral hatred” of its “Jewish heritage,” prompting Matthew Yglesias to assert his love of knishes and Woody Allen. And so it has come to this. A prominent American Jewish blogger thinks there's a connection between knishes and liking Woody Allen, and being seriously Jewish; even if he was being facetious, Serwer takes him seriously. Which, if you think about it for a moment, is far more damning than that "self-hating" line. A Dutch journalist says the Jews have invented Swine Flu as part of some conspiracy. This particular lie has a pedegree going back at the very least to the 14th century, and you'd think it would have disappeared by now, what with our being in the modern world and all that. Upon reflection, however, why should it? Respectable and otherwise normal-seeming people routinely cast every action Israel takes as a conspiracy against the Arabs - say, designing the Oslo process as a way to strenthen its control over the Palestinians, or leaving Gaza in 2005 as another way of doing the same, and so on ad nauseum. True, not everyone subscribes to these halucinations, but they can always find platforms in respectable media outlets. When it comes to Jews, sizable segments of Western society, and almost the entire Muslim world, routinely depart from their senses and jettison their capacity for empiric analysis. So why draw the line before stories such as this one? Scheming to murder Palestinian children, yes, but disseminating Swine Flu no? Why? In Afghanistan. This is good news. First, because killing civilians is bad. Second, because the world needs the Afghani populace to support the West's effort to beat the Islamists. It's also a bit strange, the report. Read it carefully and tell me if you can figure out how many civilians ISAF has killed, in, say, 2009. I tried but didn't manage; the number doesn't seem to appear anywhere. Odd. Whenever Israel goes to war the numbers are splashed all over the media in advance, and the longer the fighting goes on, the higher the imaginary numbers get; they then keep on growing after the fighting is over, too. "When the Taliban are moving in our village, we are scared, but the good thing is there has been no bombing of civilian homes," said Baz Mohammad, a grape farmer from the village of Nilgham in the southern province of Kandahar. "A few months ago there was bombing every day in our district." "You're starting to see a lot more emphasis now on using the least amount of force necessary to get the result we want," said Capt. Frank Harnett, a spokesman for U.S. Air Force Central Command. "There's an added emphasis about noncombatant casualties. That will drive decisions made out in the field." I never cease to wonder at the people who know far less than most Israelis about the issues most important to the lives of the Israelis, who never-the-less pontificate endlessly about how they know better. This item poses an interesting question: if the Israelis are far more engaged in the political process than the electorate of any other democracy, is it conceivable they may even know more about their own affairs than some of their critics do, say, about theirs? Regular readers will know the high esteem I have for Avi Issacharoff, Haaretz expert on the Palestinians, in spite of his politics being perhaps somewhat to the left of mine. Issacharoff has a colleague, Zvi Bar'el, also at Haaretz, whose brief is the rest of the Arab world, perhaps even most of the Muslim world. Bar'el dosn't write much about the Palestinians, that's Issacharoff's job, and Issacharoff doesn't write much about the Arab World, that's Bar'els job. Both work mostly in Arabic, and both know a lot about their field. Bar-el is somewhat to the left of Issacharoff, meaning he's solidly left, but he tries and mostly suceeds to report first and slant things only second. (Just by way of rounding out the picture of the editorial board at Haaretz, Akiva Eldar knows a lot but mostly subordinates his knowledge to his politics, and Gideon Levy can't see any story about anything except through the prisim of his warped politics. So you get all sorts of lefties when you read Haaretz). It should be said from the onset: Do not freeze settlement construction, do not stop it in part or periodically, not for six months, not for a single day. As long as the U.S. administration does not present a comprehensive plan that explains its endgame - what the end will look like and what the shape and character of the Palestinian state will look like - the demand for a cessation of construction is pointless. It is a pathetic return to the doctrine of "confidence-building measures," which led nowhere. The demand to freeze settlement construction is like the demand to remove roadblocks or cease razing homes; all these demands and similar ones mean only one thing: making the continuation of the occupation a little more pleasant. You really ought to read the whole thing. Especially if you work in the White House. An Israeli with dual French-Israeli citizenship is taking the EU to court to have them pay for rocket-proofing his Sderot home. Is there any chance this will suceed? Offhand, I'd say about 1:1,000,000, perhaps less. Still, there's value in the attempt. Similar to the report on Gaza I wrote about last week, it's high time Israel wrested the legal realm out of the hands of our enemies and took ownership of it. The sure sign of success will be the moment our critics stop using legalese and move to some other field. We'll never get them to shut up, that's obvious. But we do need to chase them off whatever base they're on, and force them to be defensive. Discalimer: I think it's crazy that the US - the richest large country in history - doesn't have health insurance for all. I also have not the slightest opinion on how this ought to be achieved, nor why it hasn't, nor which plan is the right one and how the other one is all wrong. I live very far away, am not impacted by the issue, and honestly haven't tried to educate myself about it. The Guardian, on the other hand: now that's a topic I know something about. I read them every day to stay informed about their profound malaise (which health insurance can't cure). I don't read only what they write about Israel, since their malaise is much broader and I try to see it all. The tactics of Republicans, conservative protest groups and healthcare lobbyist-linked organisations have been decried by many commentators. And so it goes on. Yet another case where the Guardian drops any attempt to understand what reality is, and prefers to inform us what it ought to be. Generally speaking I'm not one to plug this blog. If you come and read, good. If you comment, even better. Since the whole thing is a hobby for me I don't do marketing. The previous post, however, is - to my unobjective mind - one of the most important I'm likely to post. It presents Israel's report on the operation in Gaza. This report, in my reading, is a game changer, or should be. Yet as far as I can see, almost no one has noticed it, much less read it. So if you read it, or read my summary of it, and agree with the importance, please spread the word as far and wide as you can. Send word to bloggers, your pet journalists, whomever. The enemies of Israel are well on the way to convince the world we're a serial transgressor of international law. The report shows how unfounded this is; we need to reclaim the position of legality that is so rightfully ours. The Report is here. In PDF, it's here. I have now completed a first draft of an article about Israel's report on the Gaza Operation. I hope to put it online today or tomorrow. Part of it - a small but significant part - deals with our own so-called "human rights organizations" (they are actually nothing of the sort in any meaningful way). But I admit I haven't been blogging much about the ongoing disgrace of Human Rights Watch. Upon reflection, perhaps I don't need to. These guys (here and here) are doing a fine job, and what could I add? Somebody shot a missile at a house where a top Pakistan-Taliban leader may have been, and killed one of his wives. If they did all the due diligence and were convinced he was in there, and felt their chances of killing him elsewhere were limited, this was probably a legitimate act of war, and we should regret they didn't get their man, not only that they did kill his wife. Recent history supplies quite a number of demonstrations that killing top terrorists saves lots of innocent lives. America, being big and powerful, doesn't see any need even to confirm when it carries out such attacks. Of course, there aren't any other forces in the area with the technical ability to fire missiles from drones, but that's not an argument for transparency. Israel is packed with self-appointed so called "human rights organizations", and they routinely blame their country even for things it doesn't do. Their American counterparts, however, all the Andrew Sullivan's, Glenn Greenwalds, Juan Coles, Mondoweisses etc, can't be bothered. That is, they can't be bothered when it's their own country. They'll gladly pile on when it's Israel. A couple of days ago I speculated that perhaps distance matters, and well-meaning professionals such as Thomas Friedman and Jeffrey Goldberg really see our reality in different terms than we do. This then prompted an American woman with a Jewish-sounding name to reprimand me for being a far-rght obstructor of everything good that could happen in this region, but I haven't yet decided if she's real. I mean, anyone can invent any identity they wish to on the Internet. Here's more grist for my thesis. Thomas Friedman, again, versus Avi Issacharoff. Both are fine professionals, much better than most of what passes for journalism these days. Both have been following the Israel-Palestine-Mideast story for decades. Both are well connected. I'm not certain Friedman knows the local languages, as Issacharoff does, but he has lived here. (Goldberg also knows the languages, by the way, but I'm not shooting at him this morning). And both, each in their respective context, are left-of-center in their politics. Friedman reports from Ramallah. His thesis: the Arab World is in a serious mess, but the (West Bank) Palestinians, of all people, are showing signs of vitality creativity and general adaptibility to modernity that may yet serve as a model to the rest of the region. Sounds great, doesn't it. But then Issacharoff spoils the mood. The next violent explosion, he says, is already in the works. To be fair, he puts quite a bit of the responsibility for this at the feet of Israel, but I'm not going to argue with him here. My point is the disparity between the two journalists. Richard Beeston of the London Times, by the way, tells that Hezbullah is well advanced in its preparations for the next war, in which it will rain rockets on Tel Aviv. This irrespective of the Palestinian issue, mind you; yet another reminder that we could abjectly give in to every single Palestinian demand and still the war against us would go on. So that's comforting. I finished reading the report on the Gaza operation today; tomorrow I'll try to write about it. It's a fascinating document; if there was anyone out there who bases their opinion on Israel in facts, it would be a game changer. Since most no-one does that, however, preferring to base their opions on feelings or sentiments, the writing of it was probably mostly a waste. Jeffrey Goldberg is an intelligent and knowledgable fellow. For that matter, so is Thomas Friedman. So when Goldberg starts his week by approvingly linking to a Tom Friedman column which he describes as "important", you follow the link to see what's so inspiring. Or anyway, I did. Not inspiring. Not even particularly intelligent. Sorry guys. Friedman would have us Israelis recognize that "the party's over", and that story of the settlements is up, and Obama's historic position is that he's going to enforce that. This is the Obama who, we were assured throughout the campaign, is intelligent, subtle, and comfortable with complex thought processes. Well if so, how come he and his supporters can't get their head around the reality that we're rather good at complexity, too? A majority of us Israelis would walk away from the settlements in a heartbeat if there was anywhere to walk too. As recently as 2006 we elected Ehud Olmert on a specific platform to disband most of the settlements even without peace with the Palestinians, recognizing how the Palestinians have managed to turn the settlements into their most potent weapon against us. Moreoever, a majority of the settlers themselves would accept leaving some settlements if that would bring peace. (Starting with Avigdor Lieberman). But not Modi'in Illit, not Beitar, and not, I repeat, NOT Jerusalem. As President Bill Clinton recognized in his diktat of December 24th 2000. As the Palestinian negotiators themselves have recognized, repeatedly (though they may have been fibbing, since said recognition was part of not reaching overall agreement). Obama's credibility and support in Israel is plumetting because of that distinction. Not becasue he's being mean to our prime minster about Nokdim or Itamar. The more I hear (well, read) important American Jewish pundits such as these two talkng the way they do, the more I'm convinced one part of the present dynamic is the distance between American Jews and Israelis. We're really not seeing the same reality at the moment. Though, to be fair, as Mark Landler tells us after having talked to George Mitchell, there may be whole parts of the story we don't see right now. That could change things. Perhaps. Update: Barry Rubin argues against a settlement freeze. He, also, is hardly one to fit the Friedman-Goldberg template of obstinate Israelis. As one of my readers commented not long ago (I think it was Rashkov), the standard anti-Israel narrative about the ramp-up to Israel's invasion of Gaza earlier this year is that the Israelis broke a six month cease-fire with Hamas: the whole justification for the invasion, which was to put an end to rocket fire at Israeli civilians, was bogus. A second, only slightly more subtle version, tells that the cease fire began in June 2008, and was broken by Israel in October (I think), when Israel suddenly killed six Hamas men; after that the Palestinians resumed fire, a bit, and the cease fire sort of unraveled. Either way it's Israel's fault, of course. At the moment I'm plowing through Israel's report on the Gaza Operation (I'm about half way through). It's fascinating, and I'm learning all sorts of useful things. I'm also following some of the footnotes and links. One link lead me to this document, which is full of of statistics about Palestinian rocket and mortar attacks against Israeli civilians. Indeed, for about three months there was a bilateral cease fire. The six dead Hamas men were preparing an assault on IDF forces, and thereafter there were ever more rockets and mortars - hundreds, all in all. So the first story is simply a lie. Then, on December 19th 2008 Hamas announced, officially and openly, that the cease fire was annullled; from then until Israel attacked they indiscriminately shot 66 rockets and 63 mortar shells at Israel. Apparently that particular anti-Israel story is counter factual. Maybe I'm just too cynical for my own good, but I refuse to take this story at face value. Not that it can't be true, mind you: Israel needs to purchase replacements for its aging Skyhawk trainer-bombers, so it's looking in various directions including at a South Korean plane. That part I certainly hope is true. What isn't credible to me is that anyone takes such a scenario seriously. Such a transaction must be worth a billion $, or three, and many years of followup purchases. Since 1968 Israel has purchased all its aircraft from the US. Why, earlier this decade when El Al needed to purchase a few civilian jetliners and had landed a fine offer from Airbus, the pressure from the American government was so intense that the deal fell through and the planes were purchased, as they always are, from Boeing. El Al is a private airline; the Israeli Air Force (IAF) is a government agency, all that more susepctible to political pressure. What's the chance that the appearance of this story in Haaretz at this particular moment reflects a purely commercial deliberation? Pinkt jetzt, as they say in French? No connection whatsoever with the mutual dissatisfaction between the Netanyahu-Obama offices?